Close to the beach! Spacious and bright townhouse, south facing with a garden, terrace and roof terrace. the property is perfect situated in a private complex with a big community pool, sport area and playground for children at only 800 meters from Carabassi Beach, 10 minutes from the airport and 20 minutes from Alicante city.There are only a few 2 bedroom duplexes in this complex and this one is one of the best. It is rare that these properties come to the market, so don't miss this opportunity. 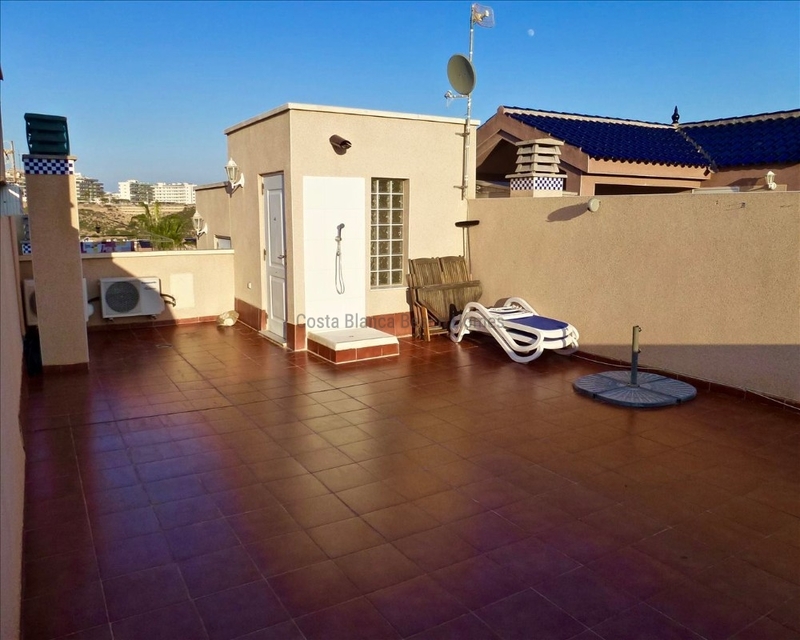 The property is 114 m2 in 2 floors and the large roof terrace.When entering the garden you walk in to a nice South facing terrace with space for table, chairs and sunbed. Part of the terrace is covered by a roof. Inside the house you find a cosy living room with aircondition. Next to the living room is the opened kitchen with a separate utility room and a little storage room. The kitchen has recently been reformed to a modern look. Except for the fridge, all white goods have recently been changed to new ones. At the ground floor is also a bathroom with shower.On the first floor, 2 bedrooms and 1 bathroom with tub. In the master bedroom is aircondition and a separate integrated room with 2 big built-in closets. From the master bedroom there is access to a big South facing balcony. The balcony has been glassed in with sliding windows, which makes it a perfect extra living room especially in the Winter. On the top of the house is big solarium with an outdoor shower. The roof terrace is very private. Underground parking place and a storage room belonging to the apartment. It is also possible to park on the road just in front of the house. The property will be sold with furniture. All the furniture including the beds, good quality. As a new owner you don't need to do any changes or reformation. This is a well maintained house ready to move into and start enjoying the sunny Alicante. The property is situated close to bars, restaurants and buses and at only 1,5 km to the Gran Alacant center where there are many supermarkets and restaurants as well.